Buying someone a pen is complicated. If you’re reading this, you’ve probably spent time, consciously or not, thinking about your preferences. You could explain (in exhaustive detail, even!) why you want pen A vs pen B, and why that pen you once loved is now uninked and not in rotation, etc. etc. 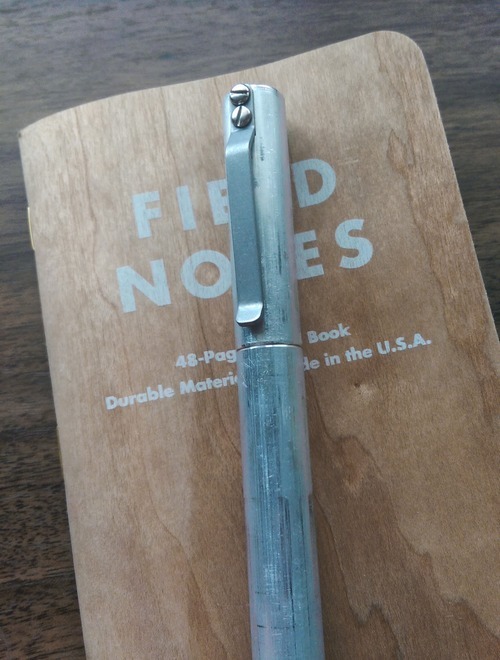 If you’re reading this, you probably also like to extol the virtues of pen fandom to friends and family, even going as far as offering to buy someone a starter pen to help kickstart the habit. Call it an aversion to proselytizing, but in general I tend to only blather about pens to people who express interest on their own. And I’ve done some consulting with these folks to help them find a pen. It’s a process I enjoy, and my method (which I’m sure I’ll blog about at some point) seems to help people narrow down vague pre-existing preferences into something a little more nuanced/complete. It’s satisfying when you can find a person’s perfect fit. Tastes change of course so no one’s perfect pen will be their perfect pen forever, but watching someone fall in love with a writing instrument is a particular joy for the pen addict. And I’ve had successes. Watching a friend open his Zebra F-701 for the first time, and exclaim “oh this really is perfect!” is great. And pushing him to mod it to fit a fisher refill and exchange for a metal nock? Even better. But he asked for help. Despite everything I said above, there’s the occasional person who I just want to win over. For whatever reason even if they have little to no interest, I tell myself I’ve picked up on a glimmer of latent pen fandom, and I decide with or without their help, I will find them the perfect pen. We’ve known each other for… 12 years? Maybe slightly longer if you count the internet. And she is the furthest thing from a pen addict. She is a woman of preferences, strongly held ones, but pens are just tools to her. I was determined to solve this problem I invented. 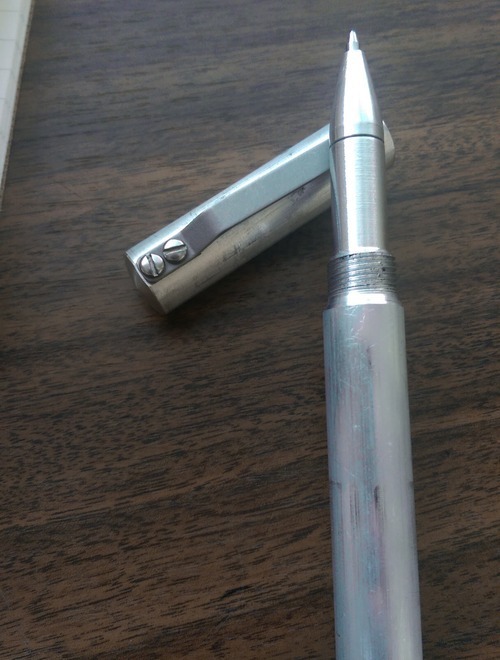 I asked her a couple times if she had any pens at work she liked, and got a blurry picture of a rollerball. Had her try some pens here and there, but it was always quick and offhand. 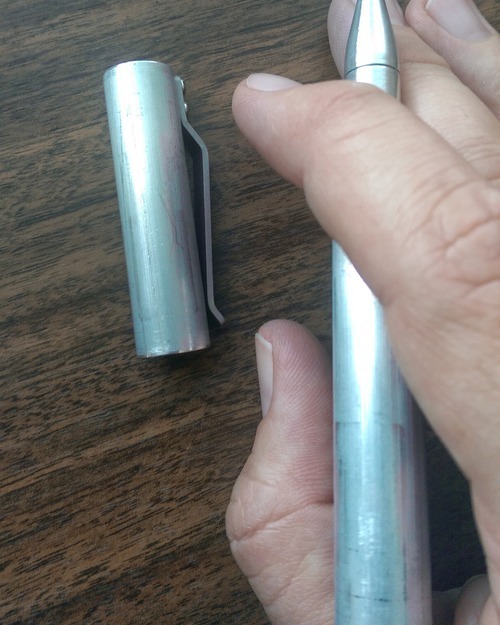 What I gathered was that she wanted a heavy pen, with a cap, a smooth and juicy rollerball, and had no interest in being part of the decision process really. The Render K seemed promising, but at the time I only had the white delrin version which she was less than impressed by. 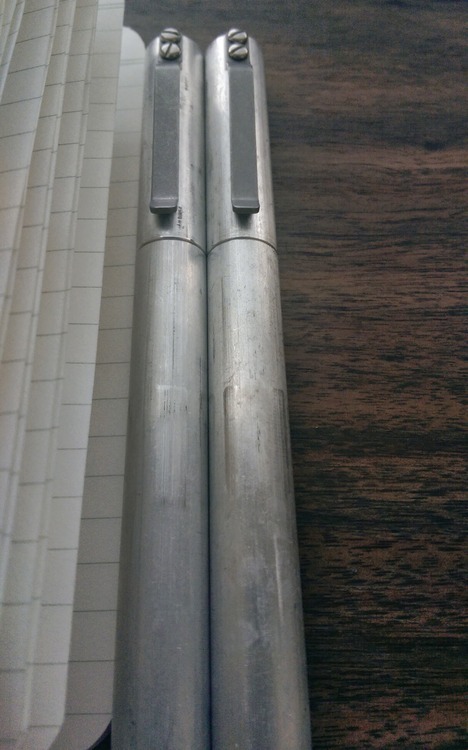 A couple weeks ago Mr. Mike Dudek of the great, great blog The Clicky Post posted that Kara’s Kustoms were closing out their Raw Bar Stock Render K. Immediately I knew I’d found L’s pen and ordered one the same day. It’s a heavy thing, unpolished, unfinished, just a raw metal tube with the lightest of shaping. By pen review metrics there are a lot of downsides here. It’s rife with imperfections and doesn’t post, for example, but all of the things you could dock it for are the reasons it’s such a beautiful thing. And more importantly, are the exact things I thought would make L love it. It feels good in your hand, and doesn’t fade away like some pens can. It’s always present, heavy, and asserting itself while you use it. Happily I was right. It took about five minutes and a few skeptical looks for L. to fall in love. Two days later I watched her write “this pen this pen this pen this pen” absentmindedly while we watched tv, and a week or so later got a text “I can take this on the plane with me, right?”. It won’t be the perfect pen forever, but it’s her perfect pen for now. And while I’m sure she won’t become a pen addict, it’s still supremely satisfying to see how much she enjoys using it. And the inevitable epilogue? The day I handed over the pen to L. I bought myself one. What can I say, I’m a pen addict.